I just saw a blog post from Marcel van den Berg on his virtualization blog UP2V.nl. In his blog post he mentioned that Gartner has updated their annual overview of the x86 virtualization solution overview – Magic Quadrant for x86 Server Virtualization Infrastructure. 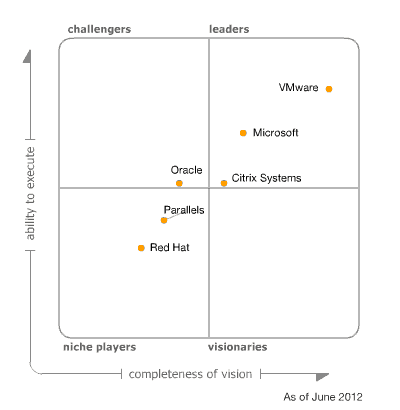 What is interesting to see is that Microsoft Hyper-V is moving closer to VMware vSphere. And I am really sure that this will be the same in the future, because when people realize what great product comes to market with Windows Server 2012 Hyper-V it can have a true impact on VMware sales/upgrades.